If you choose "Send to Selected" any customers checked will receive Payment Reminders. If you choose "Exclude Selected", any customers checked will not receive Payment Reminders. There are three types of Payment Reminders; Before the Due Date, On the Due Date, and After the Due Date. Each type has an ON/OFF button to enable or disable that particular payment reminder. Some customers only need a gentle reminder after a payment has become overdue, while other customers might need a little more reminding. You know your customers better than we do, so you decide how often and how many payment reminder emails you want your customers to receive. 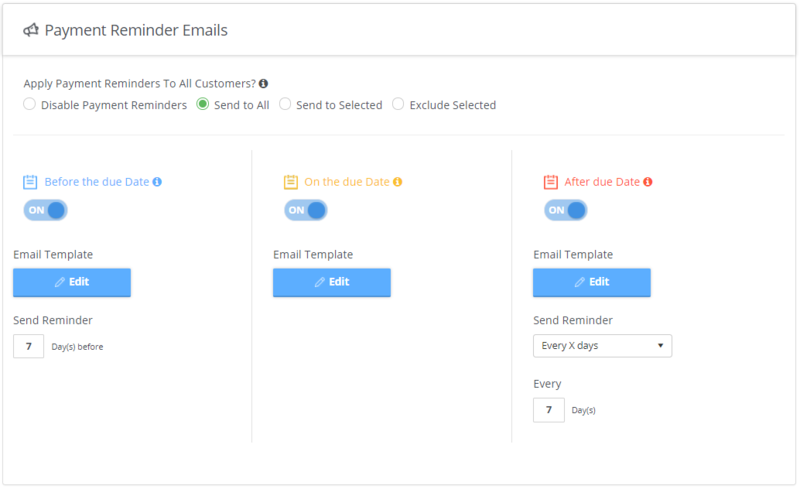 Each Payment Reminder type also has it's own email template. (For more information on how to customize your email templates, click here). 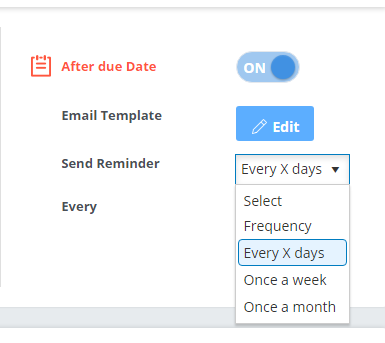 The Before the Due Date Payment Reminder gives you the ability to choose how many days before the invoice due date to send a payment reminder. This defaults to 7 days, but you can change that to suit your needs.